After nearly 14 years of continuous combat operations, there have been many major advances made in casualty care by medical professionals in the US military that have resulted in the highest casualty survival rate in the history of modern warfare. The implementation of Tactical Combat Casualty Care (TCCC) in military units has drastically reduced the number of preventable deaths from traumatic injuries. Many of the lessons learned on the battlefield translate well to the austere conditions encountered every day in the wilderness. A lack of resources, extreme weather, and delayed transport to established any medical facility are just some of the common challenges practitioners and participants face. 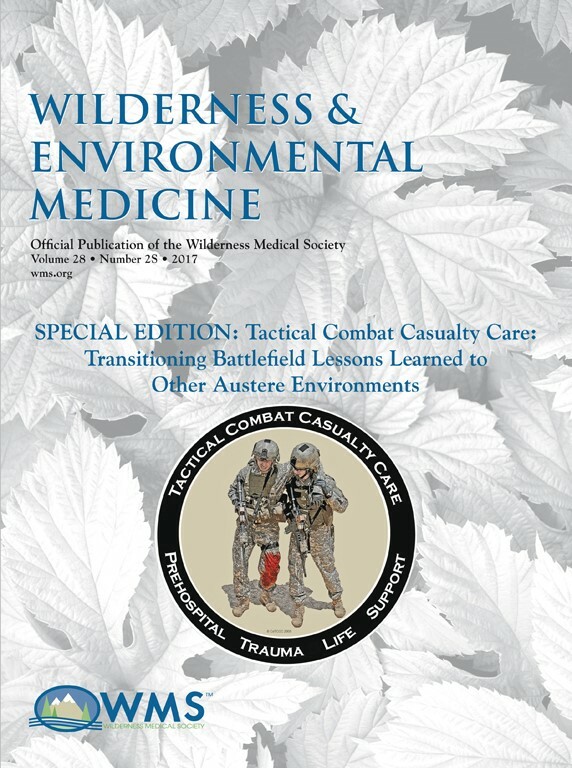 A special supplement to Wilderness & Environmental Medicine offers an in-depth examination of military trauma techniques to help educate medical professionals and the end-user community to improve readiness and outcomes. Shaped out of a preconference held last July in Telluride, Colorado, Tactical Combat Casualty Care: Transitioning Battlefield Lessons Learned to Other Austere Environments provides an overview of TCCC, explains the evolution and adaptation of the guidelines, discusses key updates, details ongoing TCCC process improvements, describes how these procedures can be best utilized in austere environments, and finally, explores how TCCC tenets have successfully been applied to civilian medicine. Preventable trauma deaths mostly occur from three main causes: bleeding, airway obstruction, and collapsed lungs. This special supplement contains 19 papers exploring different aspects of TCCC and specific trauma care techniques including tourniquet and hemostatic dressings use, establishing surgical airways, thoracic trauma care, integration of military-established trauma techniques into other settings, and key lessons in establishing guidelines and their use. Wilderness & Environmental Medicine Supplement: Tactical Combat Casualty Care: Transitioning Battlefield Lessons Learned to Other Austere Environments. Credit: Wilderness & Environmental Medicine. TCCC guidelines can help medical professionals, but can also aid first responders and civilians. In an emergency situation, medical professionals are often not the first people on the scene. Many of the practical recommendations can help those encountering trauma victims, whether it be far from other help in the wilderness or in an urban area. A new nationwide effort called “Stop the Bleed” was developed using TCCC guidelines to teach laypeople how to control hemorrhaging in an emergency. This special supplement to Wilderness & Environmental Medicine, volume 28, issue 2S (June 2017) is published by Elsevier. Full text of these articles is available to credentialed journalists upon request. Contact Theresa Monturano at +1 215-239-3711 or hmsmedia@elsevier.com to obtain copies. Journalists wishing to interview the guest editors or authors should contact Dr. Brad Bennett at brad@wms.org.